Woodlands contribute substantially to the character of the countryside, clothing the sides of valleys and hillsides, forming copses and wider swathes of wood. The amount of woodland varies from county to county, in some areas broadleaved woodland dominates whereas others have a preponderance of coniferous plantation. The national average for woodland cover is about 8.3%, with Surrey, Sussex and Hampshire being some of the most ‘wooded’ counties. The oak is perhaps one of our largest native, broad-leaved trees. 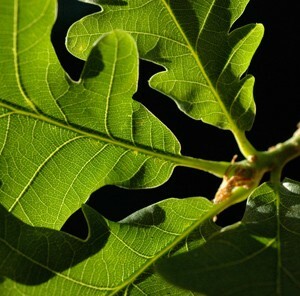 There are two native species of oak; the sessile oak (Quercus petraea) and the pedunculate oak (Quercus robur). Oaks are (generally) long-lived trees that grow quite slowly, compared to other broadleaved species. Both the pedunculate and sessile oak (and their hybrids) can grow to be very large trees. Old trees can have a circumference of 10+ metres. Oak woodland has an established place in our history. The timber from oak woodland has been used extensively over the centuries. Its heartwood is hard and durable, even when exposed to dampness. The timber from oak was used for ship and boat building. In 1992, the remains of a 3,500 year old ship made of oak (and yew) was discovered near Dover. The boat was some 10+ metres in length and could carry cargo, livestock and passengers. Many see the boat as evidence of cross-channel trade at this time. In Elizabethan times, substantial quantities of oak were being used in the building of ships (for the navy) and also timber-framed houses . 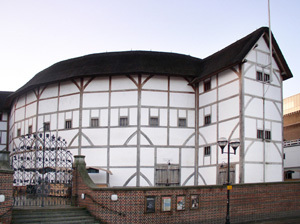 The new Globe Theatre, London is made from Oak (from the Forest of Dean), using traditional techniques. Oak has been and still is used in furniture making. Some forms of oak are unusual and desirable, for example, Bog Oak and Brown Oak. The former is sometimes found in peat bogs, where it may have lain for hundreds of year, gradually acquiring a black colouration. Brown Oak, on the other hand, is formed by the action of the beefsteak fungus, Fistulina hepatica. This is one of the bracket fungi and when it grows on oak it produces a colour change in the heartwood. This is sought after by furniture makers and wood turners. Oak and its products have had many other uses: for example, sawdust was used for smoking food, bark for leather tanning, acorns (mast) for feeding animals (pigs), and the wood for charcoal making. Oak woodland is not exclusively oak trees; other species commonly found are birch, rowan, beech and holly, with hazel and hawthorn are common shrubs. More rarely, small leaved lime and wild service may be found amongst the oaks; occasionally, pockets of hornbeam and sweet chestnut may be found, whilst damp soils will support alder and aspen. 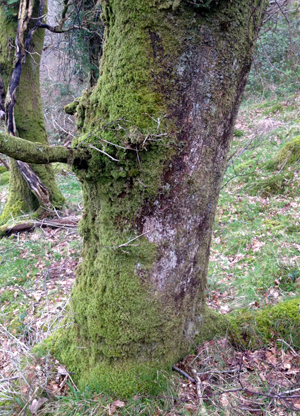 In the west of the country, the atlantic oakwoods are to be found. 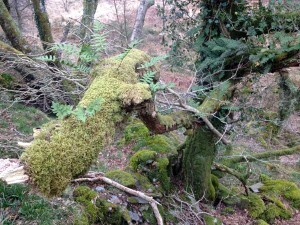 Under the influence of the wet and relatively mild atlantic climate, the oak woodland develops a rich layer of ferns, mosses and lichens (these need clean, pollution free air to survive). The main species in these woodlands are sessile oak, holly, rowan and hazel. The amount of oak tends to decrease with increasing altitude and birch becomes more and more common. Oak woodland in lower lying areas has a ground layer of bracken and bramble, and also bluebells, ramsons and dog’s mercury. So long as oak woodland is not ‘over-managed’ (e.g removal of dead wood) it supports a diverse fauna, from woodpeckers, warblers, ground beetles, butterflies such as the silver washed fritillary, wood crickets, bats, dormice etc. An oak tree is a habitat in itself, providing a home for many species of animals, plants and fungi. The oak provides food and shelter for over 280 different species of insect in the UK, and many types of spider. Oak leaves often show the scars of their activities. The bark of an oak is an ideal substrate for many lichen and moss species; the trunk and stem may be home to birds and small mammals. The roots often establish mycorrhizal associations with various fungi (milkcap species e.g. Lactarius chrysorrheus and Lactarius quietus). These associations are symbiotic or mutualistic that is, they benefit both partners. The tree provides carbohydrates (formed in photosynthesis) to the fungus, which in turn donates some of the minerals that it has extracted from the soil with its extensive mycelium. Oak woodland faces a number of threats. Small oak woods are at risk of ‘invasion’ by, non-native species (such as rhododendron, sycamore and cherry laurel) which can grow and spread fast. Sycamore leaves are often shed ‘en masse’ in the autumn - they can smother the ground vegetation, leading to a significant reduction in biodiversity. Ultimately, canopy regeneration is affected as acorn germination and seedling growth is hampered. In the past, some oak woodland was used to shelter stock, including sheep and cattle but grazing can affect the woodlands capacity to regenerate. Interestingly, atlantic oak woodland is reliant on a certain level of grazing to prevent the overgrowth of scrub and maintain ‘open conditions’. Without some grazing bramble and holly can create impenetrable conditions - so that the mosses and lichens are shaded out, and young seedlings of oak (and birch) will fail. Natural Resources Wales [NRW] suggests one sheep per hectare for the winter months; alternatively ponies can be used but they need more management and attention than sheep. 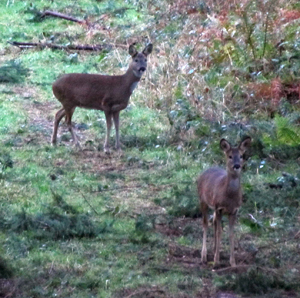 Browsing pressure from deer can be a significant factor in oak or any other woodland nowadays. Woodlands can sometimes be over-managed through, for example, the removal of standing or lying dead wood. Dead wood is important as it provides an important habitat for many saproxylic beetles and other invertebrates . I’ve recently been looking for resources to help me identify trees when out and about with the boys. I found this really helpful and has led me to your section on tree identification. Many thanks.